Just in time for Pride month, it’s a Rainbow Highlighter Extravaganza! Now that I have gotten my hands on a few more rainbow highlighters I can give you more swatches and my review on them. Spoiler alert: my favorite is still the same. If you want to read my previous post, feel free to click here and read my old review. Chaos Makeup “Kaleidoscope” $26, comes in a seashell compact. *If a link does not work, it means the product is sold out or the link has moved. The prices listed at the full retail price, some of them go on sale! Photos show the pan, outdoor sunlight, indoors during the day and under an artificial light. If the swatches look different to you, the outdoor photos were taken on a different day than the bottom indoor photos. I really love Devinah’s Susperia because they are all light, white based pigments. On my skin tone (NC15) it is very flattering, and I tend to get away with wearing white highlighter. It looks really ethereal and subtle. I don’t feel weird wearing this out, casually in the day or on a night out. This is my second favorite of all of them. Devinah also has a stronger rainbow called Unicorn Sweat. 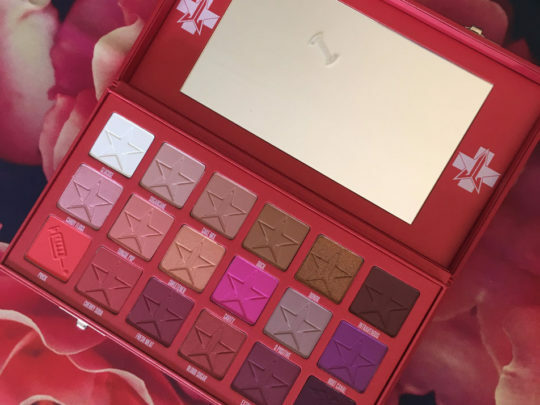 On their site, they specify that it is meant to be used as an eyeshadow because the colors are strong. This one is hands down my favorite of all the rainbow highlighters I own. First of all, it’s small. That’s not bad, it’s preferred! It fits on my cheekbone. Also the pigments are more luminous. It just glows! The green, blue and purple are not too dark, which I prefer. In the two bottom squares in the photo above, my finger missed the purple. But you can see proper swatches of it later on in this post. I will also wear this casually running errands to a music festival to a fancy holiday party. I’ve worn it on my face and on my collar bones. And the fact that it’s small makes it possible! Also known as the original! It was definitely the first one I purchased. If you only want to support the original, you can’t go wrong with this highlighter. I’ve worn this plenty of times. I like how my pan has a less green and a whole lot of purple. The yellow is the more prominent in the swatch and that’s just fine with me because I like a gold highlight. I think the Wet N Wild one developed a film so it’s a lot harder to pick up the pigment than it used to be. I remember the colors being a little more pigmented. I do have an extra one from my unicorn box but I kind of don’t want to open it and rather give it to someone who wants it. This is my least favorite. The blue is just too dark for my taste. The swatches always show the blue a thicker than it is. It’s because I am trying to my get pinky in the purple (which is too small in the pan) and I end up doubling up the blue. Not to mention it’s a large pan! When I stripe it on, the blue is in my contour. It looks ridiculous on me. Also the purple never turns up. It’s showing in the swatches because I forced it to! This one isn’t included in a lot of the grouped photos because I had already photographed the rest before it even released. At the time of writing this post, it is sold out. But I am sure they will be restocking this. Of all the affordable brands, (and large pan highlighters) this one I like the best. The colors are actually radiant and the blue is not too dark. However, Chaos still out-glows this one. I also don’t prefer the large pan, its just too big to fit only on my cheek bone. I don’t want my highlighter in my blush and I really don’t want it in my contour area! I know people want large pans because of the better value, but in my opinion, it’s not a practical size. But the colors are really pretty and I would recommend picking it up if you want a rainbow highlighter and don’t want to spend $20. This isn’t exactly a rainbow highlighter. But I thought there may be some interest in this product. It has the many colors of the rainbow, but I can’t exactly call it a rainbow highlighter because it’s not in rainbow order… therefore it doesn’t look like a prism’s rainbow is cast on your face. I also wouldn’t want to stripe this on my cheekbone, especially with the dark blue, but that’s just my personal preference. Though looking at my swatch, it would be pretty as a highlight with just half of the pan, but it all depends on where your blue drops land in your own pan. I think the pan is just really pretty and this can definitely be blended together to use as a highlighter. The color it turns out to be, probably varies from pan to pan because each one is unique. These seven aren’t the only brands with rainbow highlighters. There are a myriad of indie brands you can find online (especially Etsy). I cannot keep up, nor do I need another one! As far as more known brands, Hard Candy came out with a Trolls one in cute star packaging months ago. I wasn’t able to get that one. If you already have the ABH Moonchild or even the Aurora palette, you can create your own rainbow using all of the colors in the palette(s). The large pans are too big to swatch with one finger. It doesn’t work well that way because the color skips at the joints. And my finger barely touches the purple because of the pan’s lip, which might hurt. So use them with two fingers. And I think they all apply best with your finger instead of a flat brush. With each of them, the color applied more pigmented and even using my fingers. With a brush, most of them got really powdery with kickback. I have shimmery dust of all colors everywhere. As you can see they are both really pretty and have a glow to them. It’s all up to you what you like on your own face! These will look different on other skin tones. I only come in the one. Yes, you can see my veins, it’s almost as if I’m a living human being! This is taken under a ring light. It’s hard to say where which one begins and ends, but in order are: Chaos, Devinah, Bitter Lace Beauty, Love Luxe Beauty. The second photo is Ulta, Wet N Wild and Forever 21. • Stripe it on. So the red/pink is at the top, curving on your cheek bone and it looks like a rainbow is casting on your face. • Stripe it on and and then blend them together with a duo fiber brush. This way it’s a really subtle rainbow depending on how much you are blending. • Swirl the brush in the pan. It doesn’t end up a rainbow that way. Depending on which product it is, it may turn out silvery or gold or even blue. The violet ends too far into my cheek, but there are seven colors to work with here! That’s a lot! My face in’t big enough for this. This look was made with the Anastasia Beverly Hills Moonchild and Aurora palettes. You can use an actual rainbow highlighter and use an eyeshadow brush and dip into each color, one color at a time. And yeah, I didn’t edit this photo to fake flawlessness. I wanted it to be real. These two other highlighters are from Wet N Wild’s Unicorn Box, (also sold individually). They’re obviously not rainbows, they’re just striped. That’s nothing new. Bobbi Brown and Physician’s Formula have been doing it for years. I haven’t opened them yet, but I may do swatches on my Instagram or maybe an entire blog post on the box. They look like they’re going to be beautiful, especially swirled. I’ll do swatches swirled and striped. But I probably won’t wear ’em striped cause it doesn’t have the same effect as a standard 7-color rainbow. Disclaimer: This post is not sponsored. Everything was purchased by me, with my own money. All of my opinions are my own. None of the links are affiliate links. Some links may be broken due to items selling out, or simply the website changed and product had moved to a different page. If you dislike rainbow highlighter, that’s fantastic, you don’t have to buy one. Too Faced Life’s A Festival on Sale Now!